Oceans Resort was 12 years old and due for a major repaint. 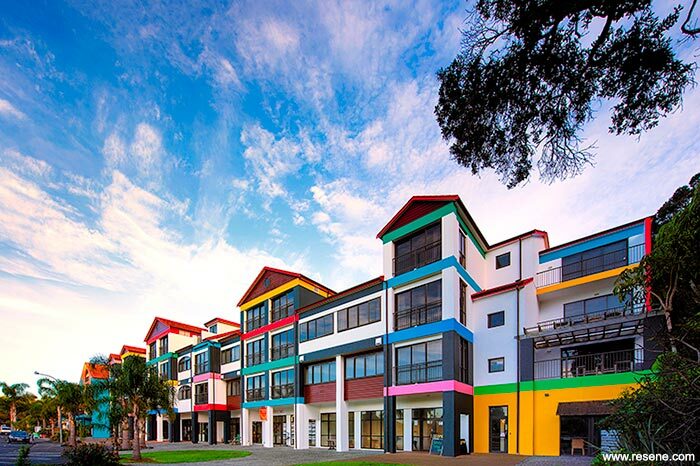 As a prominent 130 metre long and 13 metre high building, less than 100 metres from the sea, the Body Corp wanted to use the repainting project as an opportunity to make a difference on the coast. The result is certainly ‘different’ complete with its ‘Avant Garde’ title to hint that this is a palette with a difference. To decide the colour palette, the building was considered as a blank white canvas observing the parallel lines, rectangles, horizontal elements and shadows. To add an extra challenge into the mix, the resort is a tourist hub so all works had to be completed through winter so as not to affect the hotel, shops and apartment owners. 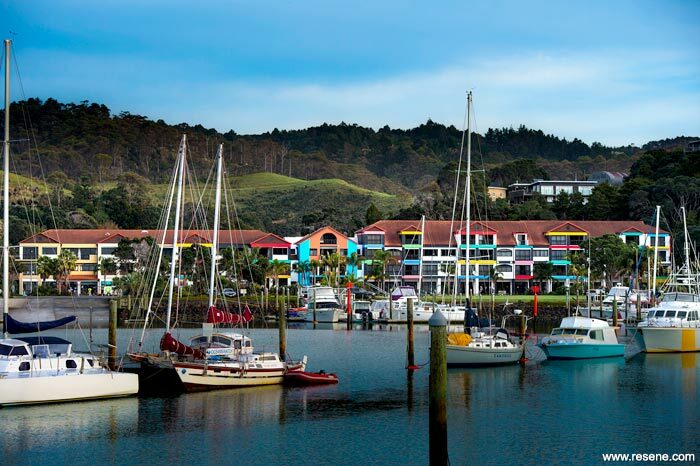 Wall, beam and column colours were chosen to represent colours found in the four seasons of Northland: Black Tree fern - Resene Deep Sea (watery teal), Cabbage tree - Resene Fruit Salad (emerald green), Sky – Resene Havelock Blue (summer blue), Night sky – Resene Cod Grey (deep dark grey), Kowhai – Resene Wazzup (loud yellow), Pohutukawa – Resene Roadster (bright red), Forest - Resene Wild West (adobe clay), Water - Resene Pelorous (porpoise blue) teamed with Resene Alabaster (blackened white) and Resene Deep Blush (warm pink), all finished in Resene Lumbersider low sheen. Soffits are finished in Resene Alabaster, fascias in Resene Roadster with Resene Clearcoat UVS and cedar weatherboards are stained in Resene Woodsman Cedar (warm red brown). It’s a palette designed for all weather – providing a bright spot on a grey dull day and an extra hit of colour on a sunny day. 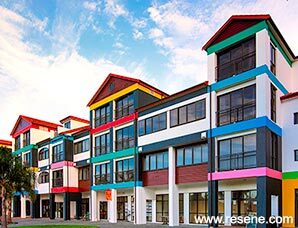 Oceans Resort – Tutukaka by Richard Cranenburgh, On the edge design won the Resene Total Colour Commercial Exterior Colour Maestro Award 2016 award. The judges thought “The summertime beach theme creates a happy joyful holiday spirit lifting a building that might once have simply blended into the background, into a local talking point. The colour placement breaks with convention; it’s bright, bubbly, bold and undeniably colourful. Colour can be used to both draw attention and distract attention and this project cleverly does both using the bold pops of colour to draw your eye across the building focusing on the colour highlights, effectively helping to camouflage other elements.